To wrap up Spinning Indie's coverage of the 70th annual Intercollegiate Broadcasting System's conference, I'm happy to present a guest blog post from one of the conference organizers: Michael Nevradakis. In addition to being a college radio veteran and enthusiast, he's also a graduate student in the Radio-TV-Film program at University of Texas, Austin. Thanks to Michael for giving us the inside scoop on what went down at the March conference in New York City! This year, the Intercollegiate Broadcasting System (IBS) is celebrating its 70th anniversary. Since its foundation in 1940, IBS has been at the forefront of representing the interests of college and high school radio stations throughout the United States and beyond. This mission continues to this day through such efforts as the organization’s political and legal support for college radio stations and webcasters regarding copyrights and royalties, and through the guidance IBS provides to schools, colleges and universities who are looking to start their own radio station. Not only is 2010 the 70th anniversary of the foundation of IBS, but it is also the 70th anniversary of the organization’s National College Radio & Webcasting Conference. 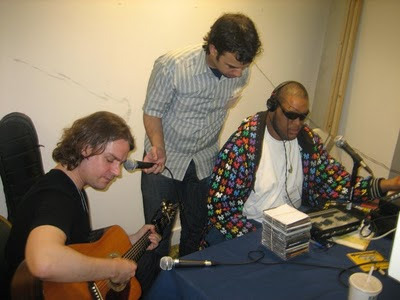 From March 5th to 7th, over a thousand representatives from college, high school and other non-commercial and community radio outlets congregated at the Hotel Pennsylvania in New York City for a conference featuring over 200 speakers and panelists, including some important names in music and broadcasting, and sat in on over 115 different sessions, panels, workshops and tours. And, most significantly, this year’s conference included the awarding of the first annual IBS College Radio Awards (click here to read Amber Wilmot’s post on the awards). Students who attended represented college radio stations from as far away as California and Hawaii. This year’s conference kickoff session featured Chuck D and Johnny "Juice" Rosado of Public Enemy, who spoke to a packed house for over an hour about their music and careers and more, and who graciously stayed for quite a while after the end of the session to speak with the students in the audience individually, answering questions, taking photos and signing autographs. 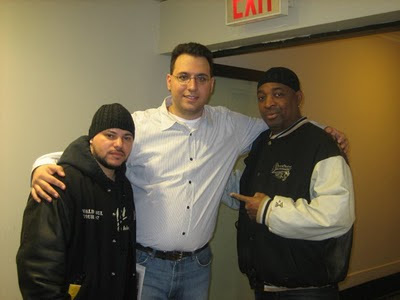 Chuck D and Johnny “Juice” Rosado were not the only famous names who spoke at this year’s conference, however. Well-known radio personalities such as Dr. Joy Browne, Broadway Bill Lee, Jonathan Clarke, Marc “The Cope” Coppola, Maria Milito, Joey Reynolds and Jimmy Fink were joined by the likes of Josh Silver (Executive Director of Free Press), Valerie Geller (author of “Creating Powerful Radio”), Alec Foege (author of “Right of the Dial: The Rise of Clear Channel and the Fall of Commercial Radio), and Larry Miller (the legendary pioneer of the “underground” FM radio movement of the 1960s). In addition, representatives from CMJ, Democracy Now!, Sirius XM Satellite Radio, the Society of Broadcast Engineers (SBE), Arbitron, the Radio Research Consortium (RRC), the Digital Media Association, Pacifica Radio, the Long Island Music Hall of Fame, the Columbia Journalism Review, and vTuner, as well as numerous record labels, also spoke at the conference. Many interesting new session topics comprised this year’s conference program. “Globalization: Virtual Study Abroad” featured the efforts of Simmons College in Boston, which has teamed up with the African University College of Communications in Ghana to develop a “virtual study abroad” program, utilizing new media platforms such as social networking sites and the internet radio stations at both schools. “Building a Locally-Based Radio and Music Network” focused on a new effort that has been undertaken by Artists 4 Music Diversity to link local stations and venues with new and established artists, and to share artist-donated music with local stations for programming collaborations and mutual fundraising. Another new initiative, College Newsnet International, an exciting new online effort that aims to serve as the “Youtube” for college journalism students from around the world, was also introduced at this year’s conference. licensing/copyright/royalty issues, social networking, remote broadcasts, streaming, podcasting, publicity and marketing, FCC licensing, automation, voiceovers, a résumé workshop, aircheck critiques, and more. Students who attended this year’s conference also had the opportunity to take part in several tours of such venues as the Paley Center for Media (the former Museum of Television and Radio), the new studios of Clear Channel radio in New York City, and the broadcast facilities atop the Empire State Building. In addition to these tours, two “Backpack Journalism Excursions” were also organized, offering students the opportunity to learn to shoot great video right on the streets of New York City, and how to edit and post their work online for a worldwide audience. Finally, students had the opportunity to win tickets to live shows featuring RJD2 and Titus Andronicus in New York City, and to take home lots of free “swag,” ranging from magazines to CDs, but perhaps most importantly of all, a plethora of new knowledge and a lot of new contacts resulting from a weekend’s worth of networking. While the next IBS national conference will be next March 4th-6th, once again at the Hotel Pennsylvania in New York City, IBS coast-to-coast regional conferences are coming up this fall in Boston (Saturday, October 9th), Chicago (Saturday, October 23rd) and Los Angeles (Saturday, December 4th). I personally would like to thank all of the speakers, panelists, and all the great and talented students and their advisers who attended the conference and who made this year’s event one of the best in the 70 year history of the Intercollegiate Broadcasting System! A special congratulations goes out as well to all the winners of this year’s IBS College Radio Awards. The IBS Board, staff and volunteers thank everyone who attended for a great conference! The Intercollegiate Broadcasting System (IBS) wrapped up their 70th annual conference in New York City two weekends ago. Although I couldn't be there to catch all of the educational sessions, radio station field trips, and schmoozing; I'm happy to be able to present some blog coverage by Simmons College student and radio DJ Amber Wilmot. Thanks so much to Amber for sending along her post about the IBS College Radio Awards winners. The Zurich Suite at the Hotel Pennsylvania was packed with delegates and presenters to hear the list of winners. Over 20 awards were presented to different colleges and radio talents. Winners received either a certificate or small radio trophy. The major winner at this years conference was DePaul University from Chicago, Illinois. DePaul Radio took home nine awards ranging from Best Newscast to Most Creative Show. Congratulations to all of the IBS Radio Winners! Simply at a loss for words about this... but am hoping to pull together a list of radio stations that are planning tributes to Alex Chilton. If you have something in the works, let me know. Radio is often the best way to memorialize our musical heroes. As I mentioned on Radio Survivor, we are now in the thick of music and radio conference season, with lots of options for those obsessed with indie sounds. SXSW Interactive is winding down, and the music portion of SXSW begins tomorrow. 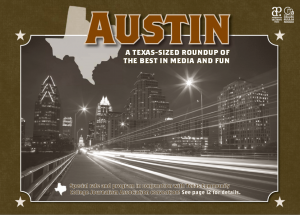 As was the case in 2009 and 2008, many college (and commercial and community) radio stations are heading to Austin to host showcases, do live broadcasts, and blog about the scene. Let me know if your station is covering SXSW too! Wanna Take in the NAB Show in Vegas? You might remember that last year my friend Kyle Barnett reported back to Spinning Indie readers about his travels to Las Vegas for the Broadcast Education Association (BEA) conference and The NAB Show (put on by the National Association of Broadcasters). It's a huge flurry of activity in Vegas, with sessions focused on TV, radio, multi-media, the web, and content of all sorts. This year the folks at the NAB Show are offering up free access to the exhibit floor (normally $150), content theater, and opening keynote taking place April 12th through 15th. Although this doesn't grant you admittance to all of the main conference sessions, it's a cool deal. Just register here and use the code A913. If you want to get a sense of what the NAB Show is all about, take a look at this video of the 2009 event that was created by students. By the way, if you plan to attend this year's BEA conference (April 15th -17th), admission to the NAB Show is included with your registration. It is now officially college radio/music conference season. The IBS Conference just concluded in New York City on Sunday and on the heels of that, College Broadcasters Inc. (CBI) is prepping for their spring convention this weekend (March 14th to 16th at the Marriott Marquis in NYC). Held along with the folks from College Media Advisers (CMA), the event will feature sessions about radio, television, journalism, and careers in media. As I did with the recent IBS Conference, I will have some guest bloggers on the scene at the CBI Convention, reporting back on the goings on. Additionally, I'll be hosting a live Twitter feed of CBI Convention-themed tweets (#CBINY). Over the years I've been particularly impressed by CBI's work in both advocating for college radio and educating stations about legislation that has an impact on student stations. They offer a free email list for college radio staff that's open to anyone in college radio, regardless of whether or not one is a member of CBI. Not limited to just radio, CBI's focus is a bit broader than that of some of their fellow college media organizations (such as IBS). In order to learn about the ins and outs of CBI, hear what's in store for their upcoming convention, and find out their predictions for the future of college radio, I chatted by email with the President of CBI, Warren Kozireski (he's also General Manager of WBSU at College at Brockport) and Will Robedee, Executive Director of CBI (he's also the General Manager of KTRU 91.7 FM and Staff Adviser for RTV-5 at Rice University). Spinning Indie: When did CBI begin and what was the initial motivation for starting it up? Warren Kozireski, President of CBI: The organization was conceived in late 1998. The idea came mainly from a previous student media organization who ceased operating. Several people thought the concept of one umbrella group supporting student television, radio, internet and more made too much sense. Spinning Indie: Can you explain the main focus of CBI and what sets it apart from other college radio organizations (IBS, CMJ, BEA, etc.)? Warren: The main difference is that CBI supports all electronic student media, which has become even more important in today's converging media marketplace. Our conference sessions are about every aspect of student media from engineering to on-air to public relations to music to management to news to public affairs to public file to streaming legalities, etc. Will Robedee, Executive Director of CBI: CBI focuses on electronic student media. We hold two conventions per year. The Spring NY convention is done with College Media Advisers (primarily print) and the Fall Convention is done with CMA and ACP [Associated Collegiate Press] - again, ACP is primarily print oriented. We find that combining our conventions to be very beneficial to all involved. Starting in 2002, CBI also coordinates the annual Student Media Awards in 23 different categories. This competition rewards the great work being done in student stations around the country and also provides the students with a great resume line. Warren: Again, unlike other student media groups we are not just radio. Our membership has consistently been around 340 member stations and associate members. Spinning Indie: Tell me a bit about what you have in store for 2010 year's Spring Convention in New York. Is there a specific focus? about important stations issues, such as streaming or advising, but the focus is to highlight what is happening in NYC and how those people got started. Many of them started at college stations. Spinning Indie: Your Spring Convention is one week after IBS's National Conference. Is there a lot of crossover between members/attendees and is it challenging to have your conferences so close together? Will: There is some cross-over, but not a lot as the focus of the two conventions are very different. 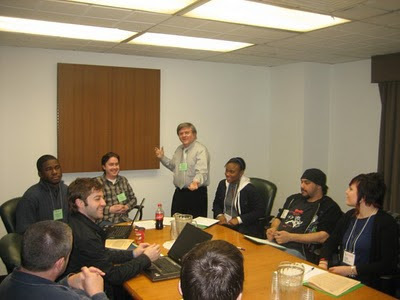 For instance, the IBS President, Norm Prusslin has been doing sessions with us for a number of years, this year included. CBI joined CMA in putting on the NY Spring conference about 10 years ago. They handle the venue, timing and many other logistics and we handle the broadcast/electronic media session programming. The proximity of the CBI/CMA convention to the other convention made us think about what made sense when programming for NY. As explained above, our focus is on bringing in the local talent to talk about trends, emerging trends, careers, internships, and life in media in general and how these people made it to the number one market. It made no sense to offer a convention that had a similar flavor to another conference held within a week or two of this one and the venue (NYC) made it easy for us to focus on the talent and media in the market. Spinning Indie: Who typically attends the conventions that you host in NYC? Is it mostly stations from the Northeast or do you have attendees from all over the country? How many people/stations are you expecting? Warren: While many come from the Northeast, we see quite a few coming from the South, Midwest and from the West. Many of the students (and some of their advisers) have never been to New York City before so it becomes a destination for both the benefit of the conference and the lure of NYC. Will: For CBI, this is a relatively small conference, but filled with big names and the lure of NYC. We are working on tours of some great facilities and will announce them later this week. This is really a nuts and bolts convention that has broad appeal to students at school based electronic media outlets. The fall convention is also attractive in that it is far less expensive because of the venue. Hotel rooms, for instance are much less expensive in Louisville than NYC. Because of these factors, we draw a much larger crowd which leads to another benefit, networking. Many students and advisers find that they learn their most valuable lessons from the peers that they meet at these events. Spinning Indie: Anything different about this year's conference? Will: I think we have raised the bar concerning the quality of speakers. Spinning Indie: Are you optimistic about college radio's future? Why or why not? Warren: I am very optimistic with student media's future. If you look at today's job openings, many are looking for audio and video editing experience with writing and web development--all skills many students are already doing every day in our operations. That makes today's students very marketable in the job search. We will have adjustments to make, and we have already made many, but I can see a near future where all of our student media on one campus is under one roof. One news department writing for the newspaper (and their website), broadcasting on radio and television and supplementing the various websites with audio, video, blogs, podcasts and more. One sales department selling all student media; one production department making pieces for radio, TV and the web; etc. Will: While I agree that there is much to be optimistic about, I do see some problems and some growing pains as well as tremendous opportunities. As Koz mentions, many students arrive on campus today without a radio, with perhaps the exception of a clock radio/alarm. A far cry from my student days when many students set up their stereo before anything else when they arrived on campus! That is a hurdle, but I see the outcome a little differently than Koz because his program at SUNY Brockport has a career/training focus, while I am with KTRU at Rice University where the station has no aspirations of training the next big media personality. I see student media as the testing and launching grounds of new media. If you remember WXYC and WREK both lay claims to be the first streaming radio station. Students often times have a better grasp of technology than older folks. It is likely that some of the real innovations in popular media are going to come from students working at student electronic media outlets. Also note that the advent of streaming audio has made it very easy and cost effective to start new initiatives. In the past, a new student station would either need to find and fund a license and frequency or be limited to other methods of transmission that weren't always popular, widely available or suffered from technical problems. Today, a student station can literally be started with a donated computer. Keeping such stations alive over a few years takes work, organization and an ability to demonstrate a need for continued funding as the station grows. CBI aims to help existing and fledgling stations through its free email lists, web site and conventions as well as free phone support via our toll free number 877-ASK-CBI1. There are many challenges and opportunities ahead for college stations, whether they are indie oriented or career oriented. The keys to survival are continuity, reasonable requirements for accessing new technology, building support for the media outlet. CBI helps stations with each of those goals through its many direct to station benefits and through efforts to keep webcasting rates and terms (including recordkeeping) reasonable and filing comments on issues before the FCC and the US Congress. Spinning Indie: What are some of the challenges faced by college radio today? Warren: College media's main issue is commercial media's main issue--adjusting to the media habits of younger demographics to remain viable. Students don't bring a radio to campus with them, so your webstream is the only way they can hear your station. They also are watching more and more television on their computers, so is the student television station providing video streaming of their programming? Funding is an issue for most to help make the above and more happen. That and marketing to students that media is still a viable career and well worth their time and effort. Spinning Indie: Is there anything else about CBI that you'd like to share? Warren: Our e-mail listserv's are free and not restricted to members-only. We decided this from day one as a support for student media and everyone involved. Also our various legal fights regarding streaming issues have been done for the (hopeful) benefit of all student media and not just our members. We feel it's the right thing to do and the membership has agreed to help fund the effort(s). Will: CBI is member and volunteer driven. Our members provide advice to each other through a free flow of dialogue on the email lists. The board members are CBI members. We are also fact driven when it comes to legal issues. For instance, we don't just provide stations with advice concerning issues, we provide them with the background concerning the issues so they are free to make appropriate choices for their operations. We believe students and advisers need to know the issues and the choices available so they can make an educated decision. These are, when all is said and done, school based student media outlets. Whether their programming is esoteric, indie, world, eclectic or mainstream, is unimportant. What is important is that CBI serves these stations. I'm pretty fascinated with the secret, early history of college radio; especially since my own college had a pioneering student radio station back in the 1920s. 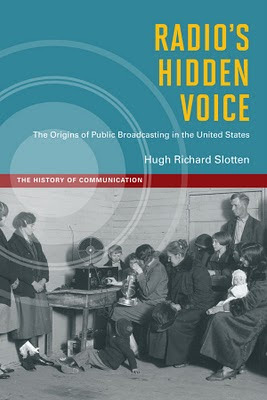 So, when Hugh Richard Slotten released his book Radio's Hidden Voice: The Origins of Public Broadcasting in the United States last year, I was thrilled to finally have a resource to turn to in order to get a better idea of how college radio really began. "Radio stations at universities were particularly important because they pioneered some of the earliest experiments with radio in the United States and they played a key role in the establishment of an alternative, noncommercial, public service model for broadcasting." Thanks so much to Hugh for taking the time to talk to me about his research into the early years of student and educational radio. You can find my book review and interview with him over on Radio Survivor. 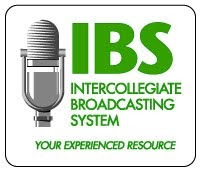 Over on Radio Survivor I just posted an article about the 70th Annual Intercollegiate Broadcasting Systems (IBS) conference, which will be taking place in New York City starting tonight. It's amazing that they've been at it for some many years and the conference itself is a great opportunity for college, high school and community radio DJs to connect with other radio folks and get tips on how to maximize one's station. I really enjoyed speaking at and reporting on my trip to the IBS event last year and will, unfortunately only have to be there in spirit this time around. Blogger Amber Wilmot will be helping out, by sharing some guest posts with Spinning Indie. I'll also be running a feed of real-time tweets from the conference on the right-hand side of this website. If you're planning to be at the conference, please share your thoughts using the hashtag #ibsconf. On Saturday, February 27th I headed over to the Swedish American Hall in San Francisco for the 2nd annual "Industry Noise" conference. As I mentioned in my summary of last year's conference, this event is a descendant of the Noise Pop educational sessions that have been taking place pretty much every year since 2000. This year it cost participants between $65 and $115 to sit in on panel discussions, hear keynote presentations, and get advice from mentors in the music biz during the day-long conference. Perhaps making it easier for working folks, Industry Noise was back to being a weekend event (last year it was on Friday). According to the schedule handed out at the event, "The focus is independent music, technology, and the path we're on as musicians, music lovers, industry schmucks, and tech geeks." The morning began with a pretty interesting on-stage conversation with musician Josh Freese. Ashli Lewis interviewed him, asking him to share tidbits from his music career. From their discussion we heard about how his professional music career began at age 12 with a stint playing on the Tomorrowland Stage at Disneyland. He worked with Dweezil Zappa while in his teens and soon after joined the Vandals. These days he's a member of Devo, A Perfect Circle, as well as the Vandals. Having performed on more than 300 albums (he's worked with Nine Inch Nails, Cher, Megadeath, Joe Cocker, Social Distortion, and many others), Ashli Lewis compared Josh to the legendary session drummer Hal Blaine. However, the main reason that Josh was at Industry Noise was to talk about his innovative method for marketing his own solo album "Since 1972." When he heard that his release from 2000 was still selling (albeit to maybe one person a week), he started to think about how it would be great to meet the people buying his album to thank them personally. From that kernel of an idea, he brainstormed a bunch of outrageous packages that he could offer to fans in order to both market his new album and get some publicity. Prices ranged from $7 to $75,000 for simply a digital download of the album ($7) to experiences with Josh. He offered up opportunities like drum lessons, lunch with him at the Sizzler, miniature golfing with him and some other punk/new wave legends, a private tour of Disneyland, ownership of his Volvo, to a chance to have an entire EP written about you and have Josh join your band for a month. The next session that I attended was a panel discussion about how young people are helping to change marketing and technology in the music industry. Surprisingly, during this panel I heard some mention that radio was still a relevant marketing tool. When asked about their suggestions for marketing a band like MGMT, Justin Little from Zeitgeist said, "their success has been based on radio." His suggestions for them included that they should "go obscure virally," but that they should also allow some of their album tracks to "develop more organically...even at radio...before it goes top 40." The panelists contrasted their affinity for technology with the old guard's discomfort and lack of understanding. Eric Frederic of the band wallpaper said, "old industry doesn't understand the way things work on the web." He added that it's best to capitalize on web buzz by getting a release out soon after. Ty White from Topsin Media added that even coming up with a band name and an album name should be optimized for the web and search engines, pointing out that the GIRLS' record "Album" probably suffered lower sales just because the artist name and record name are so generic. Ty also pointed out that as young people in the industry, "We start with fewer rules," adding that "it's possible for someone our age to never have purchased music" and that just being aware of that helps him to be a better marketer. All of the panelists acknowledged that new technology tools come and go and they are able to adapt to these changes. At the same time they admitted that there is still no perfect social media solution for bands, with Ty complaining that although Facebook "feels like MySpace 2.0...it's a necessary evil." Eric added that Facebook is great for "engaging with fans," but that it's not a great resource for compiling tour dates, music clips, etc. The final session that I attended was a keynote conversation with Claudia Gonson from Magnetic Fields. Music writer Yoshi Kato talked to Claudia about her dual role as band member and manager for Magnetic Fields. She's been playing music with Stephin Merritt since she was a teenager and has been managing him for almost as long. Claudia admitted that she sees herself more as "management" than an "artist," and describes her job as akin to "running a restaurant," with the constant stream of demands, conflicts, and logistics. At times, though, Claudia has had to stress about both of her roles as artist and manager; which she said can be difficult to juggle. She said that the band actually fired her as tour manager once and her story about taking phone calls while on stage during sound check was a reminder to her that sometimes she had to focus on one job at a time. She explained, "I do turn my phone off now when I'm in the band onstage." I was endeared to Claudia when she gave a shout-out to college radio. When describing the early success of Magnetic Fields she talked about the Boston scene, saying, "College radio is great guys...it's just great. That college kids listen to this much radio...and now it's online." The remainder of the day included mentoring sessions with music industry folks (from labels, management, publishing companies, etc. ), a panel about running one's own label, a workshop for aspiring producers, a panel full of artists (moderated by DJ/Live 105 Music Director Aaron Axelsen), a discussion about social media, and a panel about the future of the industry.